With the Edmonton Oilers’ surprise victory over the Los Angeles Kings last night, the Vancouver Canucks clinched a playoff berth and return to the post-season after a brief one-year absence. 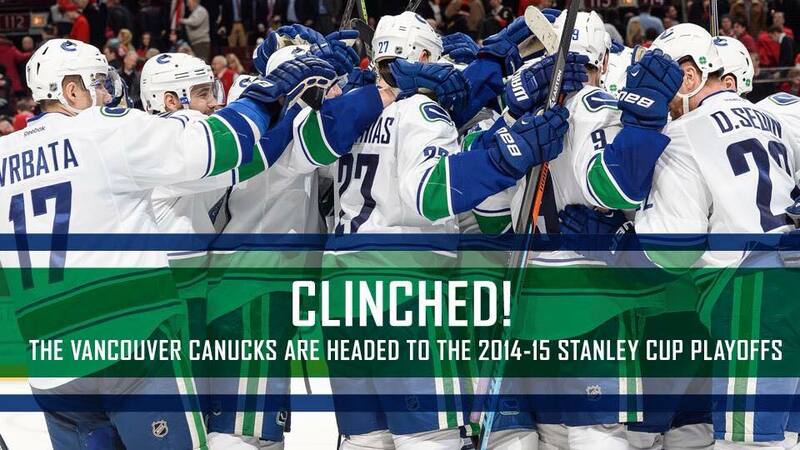 Prior to last season, the last time the Canucks missed the playoffs was the 2007-2008 season. Rob’s witty haiku was one among many that I received as soon as the Kings-Oilers game ended. And I didn’t even have to ask people to send them in. That’s how you know this haiku phenomenon is real and shows no signs of slowing. Thus, I’m proud to present to you these unedited 17-syllable masterpieces. Larry’s haiku references the multiple permutations and combinations existing for the Canucks to make the playoffs. In the end, the Kings indeed made it easy for us. Tina expresses what many Canucks fans were feeling. It was a great day indeed. Shoe Thief is right…the games are going to count a whole lot more…after the games against Arizona and Edmonton to finish off the season. This was the second of Kate’s submissions. Seems like she doesn’t share my optimism. In a later tweet, she said to me “And I’m quite serious – anyone who can give me some hope that it won’t be yet another face plant will be my hero.” Well I guess I’m your hero! Finally, Adam seems pretty confident that the Canucks will be facing Calgary in the first round. If so, it promises to be a spirited – and even – match-up.